For many bands, the prospect of a former member writing a memoir about their time in the group would be filled with stress and conflict, but for perpetually positive indie pop superstars Belle & Sebastian, news that ex-bass player Stuart David would be releasing a book has been met with nothing but positivity. As keyboard player and founding member Chris Geddes speaks to HuffPost Canada Music from his home is Glasgow shortly before Belle & Sebastian depart on their first North American tour in years, it's clear he sees David's memoir as a chance to reconnect. He says that David is "really brilliant guy" whose departure from Belle & Sebastian was entirely amicable, occurring when he wished to focus on band Looper, which he founded with his partner, Karn. Geddes states that he and David have been hanging out again the last few years, even making music together. This sense of positivity and community extends to "everyone who's been in the band" according to Geddes, meaning both David and former keyboardist Isobel Campbell, both of whom Geddes speaks very fondly of. Campbell's departure, which took place in 2002 somewhat more dramatically, when she left in the middle of a North American tour directly after a date in Toronto, Geddes admits is "a long and complicated thing but still amicable." For being an indie rock monolith, the members of Belle & Sebastian inhabit their fame both nonchalantly and a little uncomfortably. "I don't think it feels like fame, really. We've been around a long time now," Geddes says of their success, unfazed by the fact that earlier this year Pitchfork released a documentary (directed by R.J. Bentler) about the band's 1996 album "If You're Feeling Sinister." "Apart from the fact that we get to make record and get to go on tour and stuff like that, we live very normal lives. We live in normal houses in very normal neighbourhoods in Glasgow." Their environment, as well as that innate pleasantness, keeps them very grounded. The inherent niceness of Belle & Sebastian has manifested in their extremely static lineup: four current members are founding members, and the rest have all been in the band for over a decade. Geddes ascribes this long-term unity in part to the fact that everyone allows themselves an each other the freedom to pursue side projects and other artistic outlets, such as Stuart Murdoch's recent foray into filmmaking with his first film, "God Help The Girl," or Stevie Jackson's 2011 solo record "(I Can't Get No) Stevie Jackson." Another result of the patience and respect that all the members of the band have for each other and their independent work, Belle & Sebastian have been quiet as of late. Geddes is quick to point out that this inactivity is in no way indicative of a lack of dedication. Emerging from this state of dormancy brought on by side projects and other life events, Belle & Sebastian embarked on a North American tour this week. Rather than the usual formula of touring to support a new record, Belle & Sebastian are subverting that usual structure my creating a record to coincide with the tour: a collection of b-sides and rarities entitled "The Third Eye Centre," due to be released in North America on August 27th. As further proof of their pleasantness, Belle and Sebastian have chosen to book this current tour primarily as a series of festival appearances rather that many solo dates, including stops at Quebec City's Festival d'Ete on July 4th, the International Jazz Festival in Montreal on July 5 and the Toronto Urban Roots Fest on July 6, because they don't have a new record in hand and feel their fans therefore wouldn't get the requisite value out of headlining dates. Geddes says that "we felt that to be going out and not playing new music it would be better to go out and play festival dates, shows where it was a bigger event instead of our set being the whole event in and of itself." They prefer to headline when they have more to give in the form of new music. That new music is on the way however, and Geddes confirms that "the plan is to come off the back of touring and then get straight to work on new stuff" by harnessing "lots of new energy from playing together." 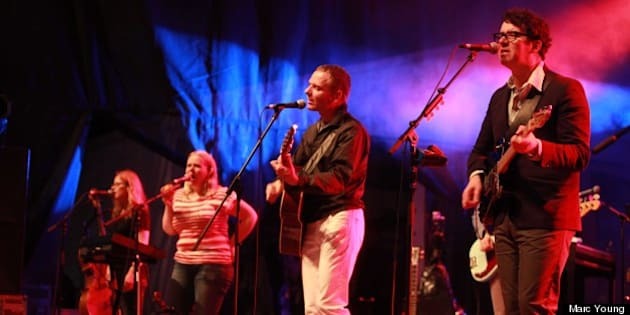 While there are no demos written or preconceived notions about what their next record will be like, Belle & Sebastian plan to go into the rehearsal room and let the songs take shape organically. Geddes is not sure if the new record will be grander and orchestral like their mid-career work, or the more spare and emotionally driven aesthetic from their earliest work on "Tigermilk" that they recently revisited with "Belle and Sebastian Write About Love," as the structure and content of their records have "always been dictated by the songwriting, the songs always dictated their arrangements." No matter what, though, we're pretty sure the result will be pleasant.